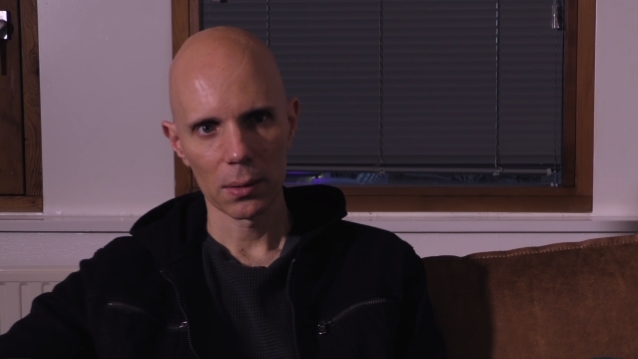 Holland's FaceCulture recently conducted an interview with A PERFECT CIRCLE guitarist Billy Howerdel. You can watch the two-part chat below. A few excerpts follow (transcribed by BLABBERMOUTH.NET). Billy: "The first batch, for sure and some are A PERFECT CIRCLE. 'Hollow' is one of the very first ones. 'Weak And Powerless' was right in there; 'Brena'. There was one that I still haven't released yet and I might do it soon. It's funny because they're pretty crude in form, but when I started, I bought a guitar. I bought a Fender Squire Telecaster, the cheap one, then, for some reason, sold that and bought a BC Rich ST-III because I wanted a whammy bar and the whole thing if you're going to play metal, you're limited on a Telecaster. But I rented a four-track cassette recorder, drum machine and a bass guitar from this place about 30 minutes away. I kind of would get a bunch of ideas in my head at least, then throw them down on the tape recorder if I could. I still have those tapes. I still revisited that, even for this record. I wrote a lot on cassette that I have archived. Now, I put it on computer and peruse through." Billy: "We don't even really discuss it. Sometimes he brings it up, but I just listen. I really don't interject. I feel like my communicating a story to who is listening is done and there's nothing to explain about it during this process. I could try to talk about it here, but it's for the things that I can't say with words that's the other language to speak. I look at it like I throw it out there, I very rarely have a strong theme where it came from where I'm thinking I'd like Maynard to know. It may have happened a couple of times in the early days. I usually don't bring it up. His reaction is pure to the music. He doesn't get bogged down with me telling him, 'My goldfish died and this is about that.'" Billy: "I don't usually start a project until I've got a good collection together. So, I've had a decent amount of songs already underway and kind of a direction for the record, but you never know where it's going to be fleshed out. It depends on how Maynard is going to sing to it and how much energy is going to it. This time, for 'Eat The Elephant', Maynard had a lot of input to the overall energy to things, too. He had a lot of things he wanted to accomplish. He wasn't in the room with me working with me. [Producer] Dave Sardy, I asked to work with an outside producer. I told Dave from the beginning, 'You're going to be representing Maynard's point of view as he's not going to be here. So, you're here to fight me on my point of view because he's not here to represent himself.' It's an exercise in dropping your ego which I suggest you never try. No, it's good." Billy: "I have to go back and think. Simplicity. He's big on simplicity. Tempo. I think he gravitates toward slower things. I probably did too, in the beginning. I think there's just more things to groove in a way in a way of a syncopated rhythm that I tend to write in." Billy: "This tour is one of the, if not the best representation we've had live. This record shines live better than any of them, I think. I don't exactly know [why]. There's certain songs like the song 'Eat The Elephant'. Its purpose on the record is perfect to me. Its purpose live didn't work as well to have it be verbatim to the record. Just a little bit of energy change went a long way with that. You know, 'Disillusioned' kind of loosened up a little bit and I think there's more power and energy there in parts to make the ebbs and flows more dynamic. It's just different having a live show than it is on the record. Even something like 'The Package'. 'The Package' on the record is great, but live, it's a highlight for me, at least playing. There's a lot of restraint in the power of 'The Package' on the record and live, there's not much restraint."